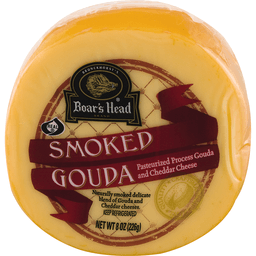 Boar's Head® Smoked Gouda. Brunckhorst's. 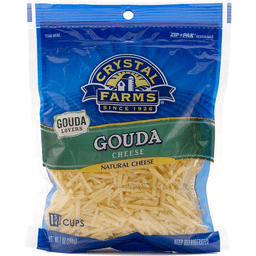 Pasteurized process gouda and cheddar cheese. Naturally smoked delicate blend of gouda and cheddar cheese. 0g trans fat per serving. Gluten free. Good source of protein. Rich in calcium. Suitable for a vegetarian diet. boarshead.com. ©2013 Boar's Head Provisions Co., Inc.
Gouda natural cheese, honey roasted peanuts & dried cranberries. New! 8 g protein. 170 calories. See nutrition information for total fat and saturated fat content. Each Snack has: 8 g protein; calcium (20% DV); 170 calories. By choosing Sargento Cheese Snack, you don't have to compromise flavor in favor of smart nutrition. 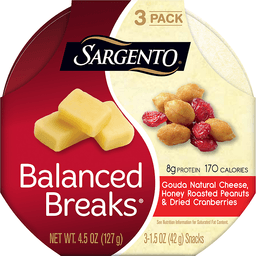 Go to sargento.com/balancedbreaks to learn more. Questions or Comments: Please call Sargento Consumer Affairs at 1-800-Cheeses (1-800-243-3737) from 9 am to 4 pm (Central Time), Monday-Friday. Please provide the freshness date on the package and the UPC bar code numbers. We are always bringing you new ways to enjoy real, authentic cheese. - Lou Gentine, second generation of family ownership. Product of USA.